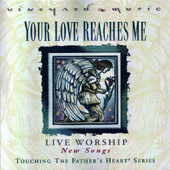 Touching the Fathers Heart: Vineyard Music EXTRA! Touching the Fathers Heart arose out of the desire to find a way to bring the fluid, spontaneous dynamics of a live praise and worship service into the studio where it can be recorded and shared with a widespread audience. The result: the Touching the Fathers Heart series. Four times each year, singers and musicians assemble to unleash glorious new worship tunes, vibrant prophetic song and heartfelt praise in a state of the art recording environment. The fruit of these efforts must be heard to be believed! Without a doubt, the Touching the Fathers Heart series provides one of todays most unique approaches to involving listeners in the worship experience.  Vineyard Music Group Product Catalogue.